Our market had bags of tiny tangerines on sale for next to nothing. So I gleefully stocked up, thinking the kids would still enjoy them, even with a few seeds and their tiny size. However, spoiled by the easy-to-peel, seedless Clementines we'd had all winter - my Sprouts did NOT enjoy them - the rather plentiful seeds and their difficulty in peeling made eating one quite a task. (This always seems to happen when I think I've scored a bargain!). So there they sat. I modified this recipe from a "palate-cleansing" tiny dab of fennel-citrus sorbet I once enjoyed between courses at a far-too-expensive and snooty restaurant. I hope they won't mind my aproximate copy. You'll be surprised, the fennel is an interesting and AMAZING addition!! 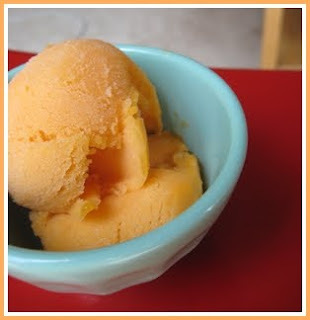 Yes, I suppose you could make this with any orange, or even canned mandarins, though the flavor of fresh-squeezed tangerines is intense and perfect for this sorbet. Juice the tangerines by hand (ugh! Sore wrist!) Or pick out all the seeds and blend and strain (just as much tedious work) Combine juice and sugar in a pan and simmer until sugar dissolves. Stir occasionally. Add zest and refrigerate juice overnight. Refrigerate coconut milk overnight as well. Mix the coconut milk and juice together and put the cold ingredients in your ice-cream maker. Turn on or start freezing process, however your machine works. After it starts to thicken and freeze, add the mandarin chunks and keep freezing. When it's almost done, (It takes ours about 1/2 hour) chop the fennel seeds medium fine with a wide-blade knife and add to ice-cream-maker. Mix a few minutes more. Store sorbet in freezer to harden, an hour or so. Serve in tiny scoops. Yum. Ok, I just have one thing to say: OMG, YUM! This is genius, sounds wonderful..thanks for the recipe and the cool idea. Wow this sounds so amazing, an ice cream maker is on my list of things that I want for my kitchen. I really like the addition of the fennel seeds.....Wish I lived closer to you TNS! Oh yum! That sounds PERFECT! I don't typically care for citrus flavor (other than whole fruits,) but this sounds heavenly! I LOVE fennel in just about everything! Yum. I never tried a tangerine flavored sorbet! This looks good and yummy! Thanks for this cool recipe! I hope they won't mind my aproximate copy. You'll be surprised, the fennel is an interesting and AMAZING addition! The next time tangerines are in season in these parts, I'll definitely make this.